A magical night in a mysterious forest with huge trees on either side of a small river stream is the theme of Theatre of Night slot. This mobile slot is played with its five reels, three rows, and ten fixed paylines and set in the backdrop of a beautiful woods with sparkling dust in the air that looks stunning. Fireflies can be seen flying all around the woods that looks like twinkling stars in the blue sky. A slow jungle beat music in the background adds an intense feeling to the game that keeps you glued all along. You can bet with minimum £0.25 to a maximum of £250 each spin. This wonderful new mobile slot is developed by NYX (Next Gen), one of the top casino based game developers in the world who come with a rich experience of over twenty years in this industry. 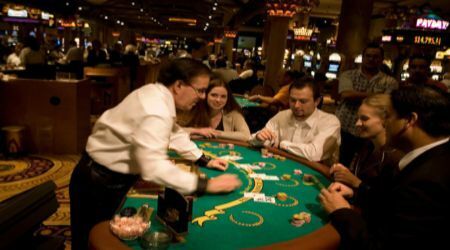 Their expertise and knowledge in advanced gaming technologies have enabled them to provide slots that suit modern generation gamblers. The base symbols of this mobile slot game are a beautiful sparkling bird, a lovely bright pink flower, and a glowing yellow-green butterfly. The bird is the top paying symbol that gives you four hundred times the stake upon landing of five symbols on the center payline. There are four lower value symbols as well, they are colorful gems in the shapes of playing cards symbols of heart, spade, club and diamond. Heart and diamond pay a maximum of 50 times and the other two pays you 35 times on five times appearance during a spin. Wild Symbol: This feature is represented by jeweled frame with a golden ‘WILD’ over it and covers for all the symbols of the slot. This appears on all the reels of this mobile slot except reels one and five during the base game, however, extends to all the reels only during the free spins. Free Spins Scatter: The wild symbol is the one that represents this feature as well and it activates six free spins once it appears on the second, third and fourth reel during a spin. During these spins, the third reel becomes a stacked wild that allows huge wins and a guaranteed win during all 6 spins. Summary: This wonderful mobile slot is loaded with lots of bonus features and mind-blowing graphics to keep you inspired. There are some motivational messages that keep appearing on the reels.